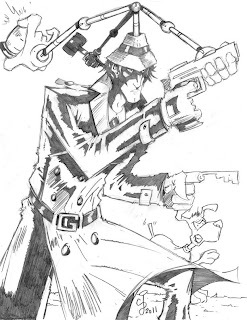 I intended to try and draw an Inspector Gadget that was a realistic, Noir re-imagining, but this is what came out. My style crept in and took over, and I was no where near the dark, Sin City-esq piece I wanted to do. Now that I have drawn the character, I may try again. But I do like how this piece came out, and it was a lot of fun, so not a total loss. And it was just a quick warm up piece, so can't really stress about it. Hope you like it none-the-less! Let me take another shot at this! So after talking with Dezi and some other coworkers on my redesign, we started playing with the costume even further. Above is what we came up with. 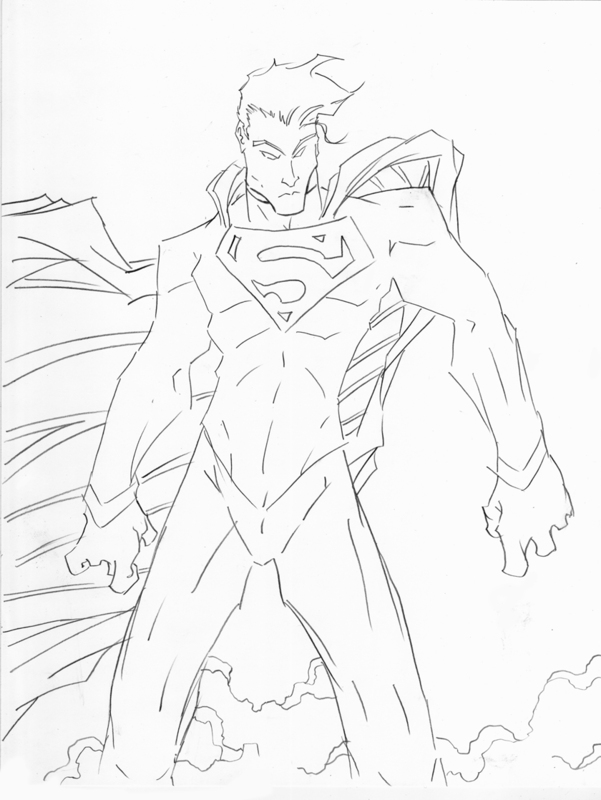 You see, I wanted to create more of a jump suit for superman, much like the Flash or Aquaman has. Superman should be like a swimmer. He is super fast, and should look like a red and blue blur that zips by. He has no need for boots, or freakin underwear. If what they say is true, much like the fast, he is so fast, that if he stood still, it would be hard to even focus on him. 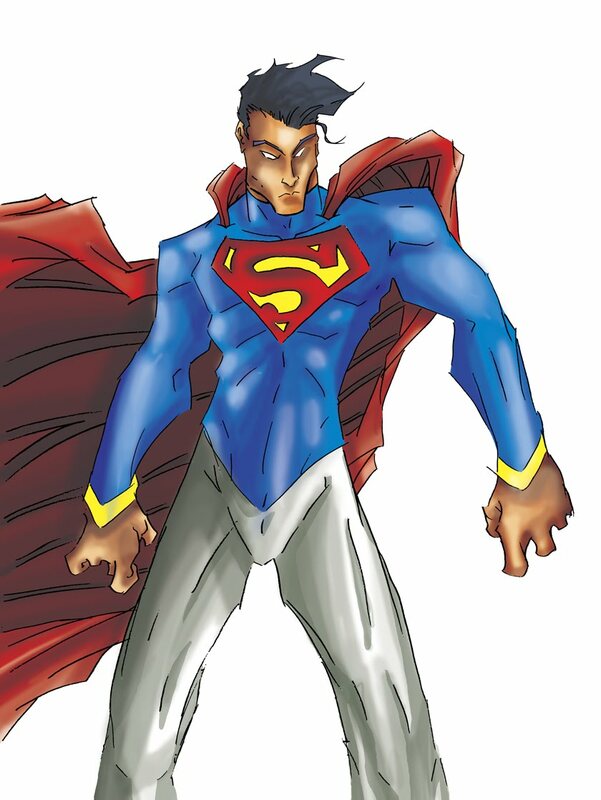 Superman should be sleek and regal. I think he looks that hear. Although, if this suit was translated to live action, please don't make it "plastic-y", lol. Thinking about it more, maybe it's "too much blue" in hear as well, we all know now what that could look like. 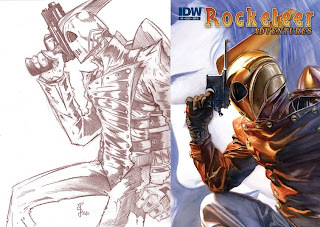 Did Alex Ross SWIPE my Rocketeer drawing?! Well, no, I highly DOUBT it. But I saw this today, and had to do a side-by-side comparison just to see. It is kinda eerie, but in NO WAY do I think it's a swipe, at all. I mean, for one, there is probably no way in hell he's ever seen this piece of my work before, and two, it's not exactly the same anyway. It's not a direct copy at all. This happens sometimes in our field, where one image is slightly like another. I mean, there are only so many positions to draw these heroes in anymore after 75 years, you know? 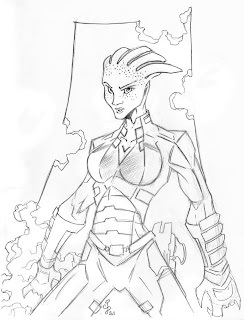 I actually got accused once by a Top Cow editor of swiping a position. But honestly, I didn't. I was in college at the time, and I have never seen this promo image that circulated months after I drew mine. It was only similar anyway, no where near the exact same. You could totally tell both were drawn from our heads. Both done around the exact same time as well, so there was no way either me or the artist knew of the others' drawing. It happens sometimes. Nothing you can worry about. REAL swipes are the blatant tracings of other people's drawings or photographs. Not something like the above, where it's a classic pose and the two pieces are just similar in nature. Video Games are Better then Movies! Just finished Mass Effect 2, and it was AMAZING! Star Wars slash Battlestar Galactica slash Final Fantasy! This game just blew my mind. No doubt I am late to the party on this one, since it was first Mass Effect and Mass Effect 2 for the XBox, but I have a PS3 and it didn't come out for PS3 until about two months ago. I spent 70 hours on this game, and I wish it was even longer. One of the few games where I want to collect ALL the trophies, AND/OR play it ALL again. I don't usually have the time or effort to ever do that, but with this game, I REALLY want to. Even my favorite games (Zelda - Ocarina of Time was the only one I've ever played completely through twice, I think). 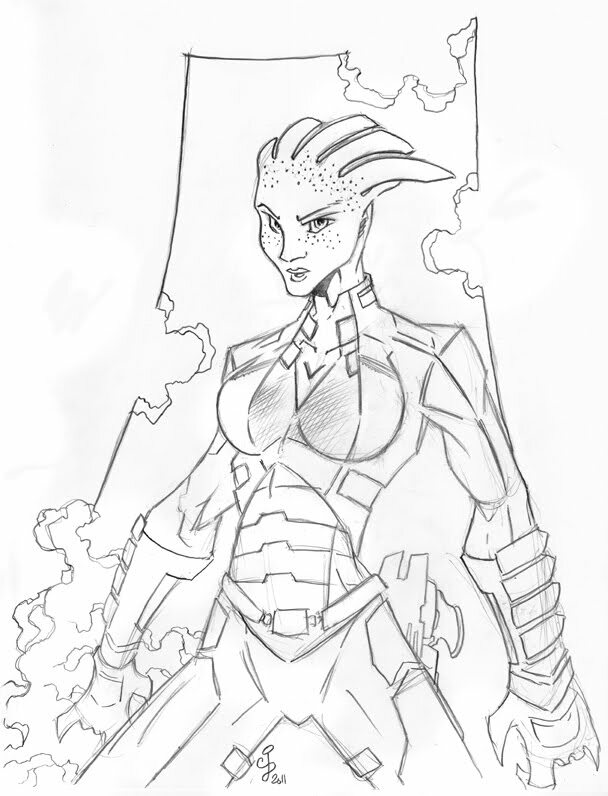 Mass Effect 2 was SO inspiring and SO motivating to me, it's beyond words. Can't say enough about this game. It has really elevated my brain as I go deeper into creating my own world, as I have discussed I am working on. Now it's off to working on my creation, and also begin playing Dragon Age 2, which is like Mass Effect 2, but with Dragons and Medieval Times! So psyched. As we usually do at work, my coworkers and I started arguing about comics and comic book movies. When the Superman Movie news came out the other week, we started arguing about how the new movie could be better then the Bryan Singer version. It spilled over into a conversation about comics and I mentioned that I hate Superman's costume, so the movie and the comics should start there. 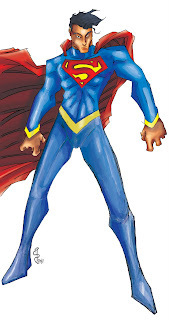 My coworkers said, no, no, you can't change Superman's costume because it's classic and that's what it is. I came back and said, fine, it really shouldn't be changed, but can we at LEAST just get rid of the underwear?! I HATE superheroes with the underwear on the outside of the costume. As Karl Pilkington would say, "get rid of it!". I couldn't convinced my friend Dezi that I could make it better just by getting rid of the underwear. He said prove it. Draw it up, and color it (he didn't think the colors would work if you got rid of the red undies). So here ya go, Dezi. In color! I like it, I think it works. 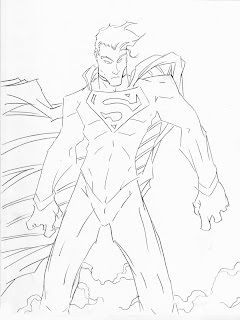 Makes him look regal, and still has all the elements of the classic Superman costume, just no belt and NO UNDERWEAR! He actually looks his age, not some silly boy scout, campy loser. I like the pointed shoulders too, like a military general's tunic. Makes him look government-ish, without losing the freedom of the classic look.